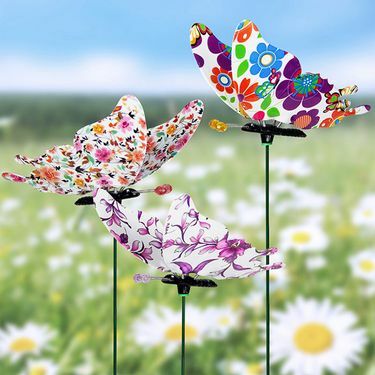 Our most popular large WindyWings Butterfly Garden Stakes in a beautiful assorted floral print design. Bring style and grace to your butterfly garden with a set of these fun and youthful colorful butterfly stakes! Each set of 6 Floral Butterflies includes 6 unique butterfly design patterns that includes mixed flowers, and other delicate floral patterns. Patented "springed" wings design allows the butterfly wings to actually dance and flutter in a wind!